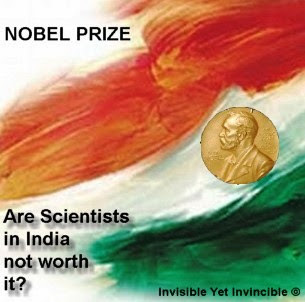 Why Nobel Prize eludes Scientists in India? All these are facts most of us can perceive ‘inside’ but feel bitter to explicitly ‘speak out’! 1. We are poor in planning: Most of our Indian professors are still reeling with 'old-world' techniques and are not good at updating! They spend their time in having coffee and waste time in politicising whatever they came across! They hardly find time to update technological innovations and are in a 'bad-mood' to experiment new things! All because they have limited funding and they 'channelise' the funding and so cannot think about 'high-impact-science' articles! 2. Most of our Indian professors are poor in English: Our professors cannot speak/understand/write good English! They are good at criticizing others but they themselves aren't aware that their backyards are 'soiled'! They hardly think about participating in 'high-wire journal clubs' and are concerned always about sending their students to 'pay their personal electricity bills, sending their students to 'buy good quality rice, pepper and sometimes washing their cars and sometimes even dropping their children at school. Some want their students to 'pick them up' every morning from home and some want their students to get tea and snacks from a high quality restaurants! (if he/she doesn't abide his/her life will be shattered 100%) How can you expect a nobel prize? 3. Our infrastructure is poor: Although just a delay in procuring the chemicals required for experiments we cannot say that our research is poor! The net outcome within a particular duration matters! Our infrastructure has to be refurbished! All old instrumentations and 'glasswares' need to be replaced with state-of-the-art automated polypropylene instruments! Technicians need to be trained with updated technical expertise! 4. Bribe in university appointments: How can one anticipate nobel prize in a country with their high-level university administration involving themselves in bribe? How is this possible?? Right from the appointment of a peon to the ‘highest-level’ recruitment our system is handicapped with 'corruption'! Yes, we stand in the 80’s after the 'very-poor' African countries in corruption! Pathetic! Can you ever dream a nobel? 4. Most are back-pullers in India: This is the reason why most of our Indian brothers go abroad where there are 'very-few and rare-back-pullers'! One man cannot tolerate others growth! Never in India!! And the other guy cannot be tolerant enough always to 'feel the pinch' given by the 'back-puller'! A fellow Indian will 'pull down' the 'other person's' leg everytime he tries to win a prize! Ask yourself if it’s true!! This is there right from private to government systems, everywhere 'in India' except a very few people who really cares for you! Will you ever dream a Nobel prize in India???? Will you??? No...Never...ever!!! 6. You can never speak out: Dictatorship is the most common thing you get to see in most of the Indian institutions! You could hardly speak to your institute director! Why because he is always busy or he has many 'sub-ordianates' who could help you solve the problem! Every citizen has the right to live and speak out what is wrong and where the glitch is!! We hardly have the right to speak!! And we hardly speak to our inferiors! Imagine (including recent Nobel awardee, Dr. Ramakrishnan) it's all your students and postdocs who got you this laurel (of course you acknowledged this at Karolinska..)! Acknowledge due credit to your students always, be it your master students, your postdocs and even your peons and personal attendants....should one day this 'otherwise-rare-thing' to happen! It’s all your hard-work, perseverance, prayers, obedience, equality, mutual respect and more importantly 'human-values' that will gradually bring our country on top! And as far as an Indian student could perceive, Nobel prize is for NOBLE people who live and toil in SCIENCE for years and decades and not for us ' Indians' who hardly find time to sit and think and write grants! Lets feel proud that this Prof. Ramakrishnan during his student tenure ‘managed’ to escape from the corrupt Indian system, from back-pullers and so so... to win this feat! Sorry, if I had hurt someone so badly!!! This is the truth! Ask your conscience, if I am right!! !